Our task of the day was located at the Marston Marsh Reserve, to the south of City Centre. In order to get onto the reserve, Tom had to drive our van on a bumpy dirt path. Once we got on to the marsh, we split into two groups. The task of the first group was to remove rotting fence posts from the periphery of the marshland. During the summer, the marsh hosts several cows that keep the level of the grass down to a manageable level. Because these cows are graciously loaned by surrounding farm owners, the groundskeeper of the marsh needed to ensure that they would not escape the marsh and become sad, lost cows. I volunteered for the second group. 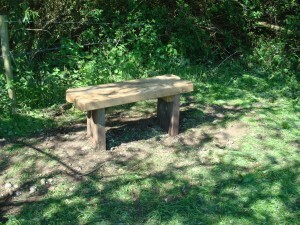 Our task was to install a bench for the park goers. We decided to place the bench facing a small stream that runs through the marsh. First, we had to remove several branches from the area in order to make the bench accessible. Then we determined where the columns of the bench would be placed, and began digging. Using a spade, I began digging a hole approximately one and a half feet deep. The layer of topsoil was easily removed and discarded to the side. However, the bedrock below the marsh soon proved to be extremely difficult to dig through. My accomplices used a spear shaped iron tool as leverage to separate the bedrock, which was heavily compressed into the soil. Then, I would use the spade to break up and separate the bedrock from the soil further. The rocks were difficult to remove using the spade, so I often had to remove and discard them by hand. I repeated this process several times, occasionally causing sparks from the spade hitting the bedrock. Des joked that I was lucky that there wasn’t much gas under the marsh. 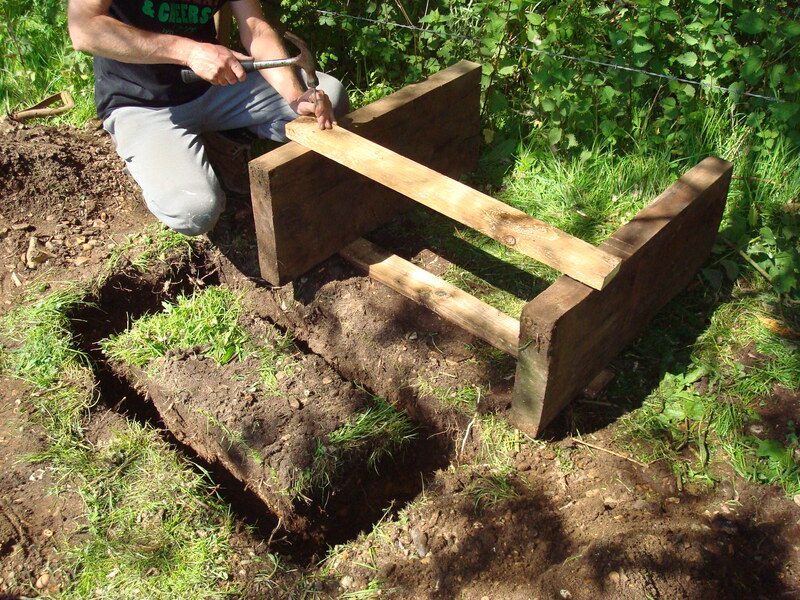 Luckily, the bedrock gave way to softer clay, and we were able to insert the columns of the bench into the ground. Then, we dug two ditches that were perpendicular to the columns that had been placed into the ground. These were much more shallow than the depth that the columns needed, but we needed enough depth on the side of the columns so that side bars could be placed on the front and back of the bench. These sidebars would be buried underneath the ground, in order to make the bench too difficult to remove for any of the vandals that frequent the marsh. 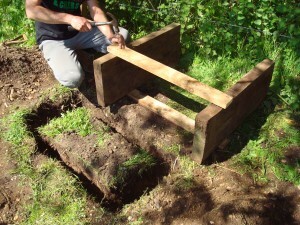 After nailing the sidebars into the column, we placed the base of the bench back into the ditch. A support block was placed on the inside of each column, and each block was held to the column by a large gauge bolt. Using a twist drill bit, we drilled a hole for the bolt through the side of the column and the support block. Two holes were drilled on each side of the column and block, and were attached using the bolts. Then, we attached the seat of the bench to the support blocks. The seat comprised of two oak boards, which were secured onto the support blocks by first using a drill bit to make a hole, and then securing the oak boards to each support block using a large gauge bolt. After all of the bolts were secured using a washer plate and two nuts, I used a hammer to beat down the threads of each bolt, thereby preventing any thieves from removing the nuts and deconstructing the bench. 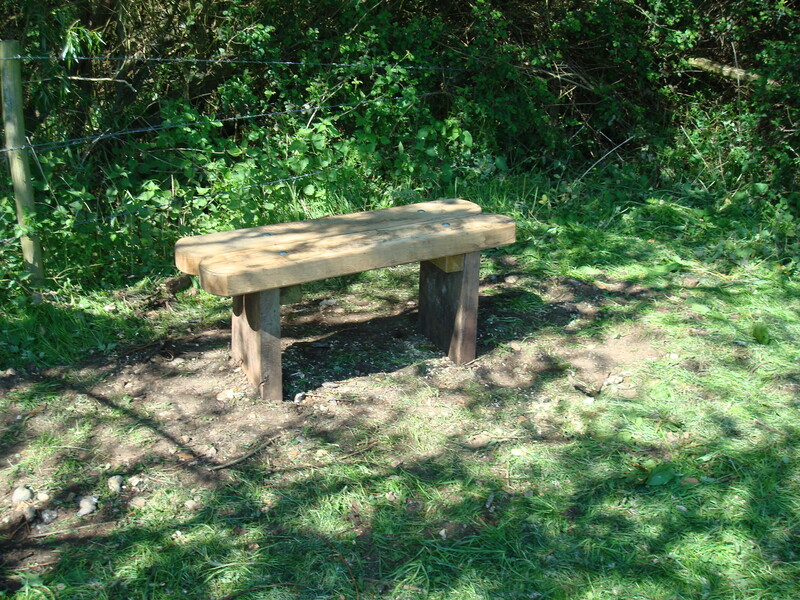 Because the bench was constructed using only oak, and bolted instead of using nails, we were confident that any thieves attempting theft of the bench would give up out of frustration. My palms were fairly bruised and sore from using the spade to break the bedrock, but I was satisfied that park goers would enjoy our creation for years to come. I learned that a well-maintained fence must supervise cows, for fear that they escape. I also discovered that the landscape of a marsh may look soft and lush, but the ground beneath may be tough to break through. But the most valuable lesson of the day was learning how to theft-proof a bench in a public park. For the last portion of my volunteer hours I decided to have a change of scenery and volunteer down at the Norwich Cathedral for the Easter festivities. Again my volunteer hours included small children. This was my first time actually visiting the inside of the Cathedral. To my surprise the Cathedral’s interior appeared to be much more enormous than its exterior. But just like every Cathedral I have visited in England there were dead people and monuments where ever you looked and stepped. I guess some things don’t change. For the volunteer services I was assigned the arts and crafts table. I predict they knew of my quality background with the Brownies. The arts and crafts table consisted of making Easter Baskets for the egg hunt, Easter Card making, coloring, Jesus fortuneteller making, Easter word searches. Luckily both days I had help from Jess and Sheila one of the nicest older persons I’ve met in Norwich . Together the three of us were able to handle the multitude of families that came our way. The days were long from 10 am to 2pm. However, unlike the Brownie pact the Cathedral seemed a lot more organized in their event coordination, especially when taking into consideration the amount of people that arrived. In addition, unlike my Brownie pack there was a lot more diversity in the people who visited. The truth is the Brownie pack costs money, which many working class families can’t afford making the pack itself very one dimensional. At the Cathedral in contrast I saw people of different economic backgrounds, races, and nationalities. It was refreshing in a sense to meet different people while simultaneously be scrutinized for my accent and complexion. In my short time in the cathedral I also made a best friend of four, named Charlotte. She called me her best-friend because I told her the basket she made was the best even better than my own. My life is complete I have a best friend! After coming home and reflecting on my experience in both the Brownies and the Cathedral I have convinced myself that a career with children is not for me. I have the highest respect for the adults who have the patience to work with children day in-and- out. I also have accepted that not joining the scouts back at home was possibly the best thing for me. And I have resolved that if I ever have kids not to make them participate in such things. Instead I think I will make them join football or Karate, something normal. The experience I have had in both locations and the things I have learned were completely unexpected but very valuable. Did you know that Mother’s Day is different in England? Apparently, the English decided Mother’s day is the first Sunday of April. Day three of Brownie Munchkins was Mother’s day arts and crafts. The girls were allowed to decorate wooden frames for their moms and make cards from scratch. I was put in charge to patrol the girls’ sleeves from all the wet paint lying on the tables. However most of the time I was hoping the girls’ would let me squeeze in between them so that I could use the rubber stamps to make Momma Lopez a card. The plan quickly failed as I was reminded by a seven year old that I’m an adult and I was suppose to be watching over them and not playing next to them. When did that happen? I still love arts and crafts! I mean I still know how to color within the lines. Oh well I guess it’s time to accept I’m old. The night had arrived, two girls were going to be initiated into the group. However, before I tell about that part of the night I must tell you about beginning of the night. Unbeknownst to me until late Thursday the 17th of February my flat mate Vicky and I were in charge of planning two activities for the beginning portion. Vicky and I had a Brownie intelligence early Friday morning. We carefully read the description of the night “Pamper evening- yoga, relaxation, incense, lip gloss, face masks, nail varnish.” I thought to myself all these tips were either messy or an opportunity for one of the girls to get hurt. After all, the week before I arrived one of the girls (Mary) apparently could not hit the brakes on time and stopped with her face in the wall. Seeing as the girls harm themselves all on their own I was not going to egg them on. Just like light bulb turning I got an idea. Vicky and I immediately proceeded to go to Tesco’s. We bought three king size slabs of milk chocolate, oranges, apples, and marshmallows. Our activity for the girls was fondue chocolate with fruits or marshmallows. The perfect solution for the girls, taste good and they won’t get hurt. WIN! Like every child activity though the adults (i.e. me, apparently) end up doing most of the work to set up everything. Followed by intense cleansing of the girls sleeves. Whoops, guess we forgot the messy part. But it was completely worth it. The final and anticipated part of the night had finally arrived. The initiation ceremony was equipped with the pond (blue construction paper) a tree ( a small pot with leaves) and a brown owl ( not a live one). Each girl was escorted from the back of the pack through the “woods” to the pond where they are suppose to see their own reflection and realize “they are brownies” (Brownie Munchkins being the indicated terminology). The Brown Owl, or Emma as I refer to her, asks the girls a series of Brownie questions with the final one requesting the brownie oath. 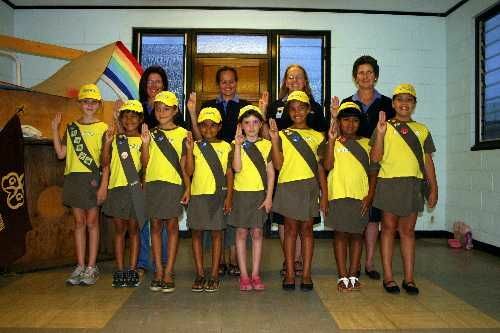 The brownie promise is as follows: “I promise that I will do my best, To do my duty to God, To serve the Queen, And help other people, And to keep the Brownie Guide Law.” After this recitation the girls officially became Brownies equipped with first badges and pins for their sashes. Again, I was taken aback with the weight of the words within Brownie promise. Girls of seven to ten are expected to take an oath stating to “do my duty to God, To serve the Queen.” It was at this point where I became fully aware of the enormous effects these organizations have upon new generation. I’m sure that at this point the girls of the 38th Norwich Brownie pack do not yet begin to understand the words they repeat every week, but they have them memorized, and one day they will realize how engrained this notion of patriotism is. The United States is not any different. The oath the girl scouts take is: “On my honor, I will try: To serve God and my country, To help people at all times, And to live by the Girl Scout Law.” Just subtract the queen and insert country and presto same Oath. The fears of older society that the new generations will not be loyal to their homeland are still very prominent in the 21st century. My second day with the Brownie Munchkins took place on February 11th. On day two I am happy to report that I effectively learned the Brownie Guide song! My life as a college student is complete. If you have noticed the lyrics it definitely illustrates the original intentions of this organization: to create patriotic God fearing women citizens. The theme for day two was board games evening. Surprisingly, the Brownie Song was not the only thing I learned this night. On this occasion the girls were asked to bring their favorite board games from home that can be played with at least four people at a time. Out of ten board games seven of those brought were Chutes and ladders or as the British people call it Snakes and Ladders. Can you guess which game I had never played as a child? That’s right Snakes and Ladders. Thankfully, my awesome Brownie Munchkins taught me how to play legally and illegally (7-10 year olds always want to win) seven different times. By the end of the night I was an expert class 5 snakes and ladders athlete. Also, Emma the supervisor (just for two more nights) announced that the following Friday would consist of the planned theme (Pamper evening) and the initiation into the troop of two girls. I was stoked to see how you initiate 7 year olds. We talked about the nature of my project and what sort of writing was possible for Norfolk Nips, I explained my credentials and my willingness to write on any topic and we finally decided that pub reviews would be good for the magazine. The way in which Warren invited me into his home, on his free time, to discuss the idea really speaks to his personal commitment to his organization, as well as to the organization’s effort as a whole. He was genuinely excited to talk about the articles and it appeared that having a young person interested in the real ale movement was very important to him. 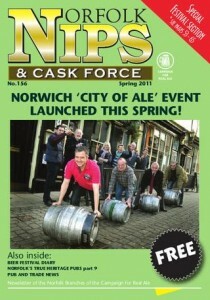 It is a testament to the pride that Norwich has in its local businesses (specifically pubs and breweries of course). April 11th 12:30-13:30 in my room in Norwich. Planning my route and reading pub reviews to decide which three pubs would provide nice diverse articles and could be walked to in a reasonable time. Hour spent taking notes on pubs appearance, wine and beer selection, meal selection and sampling one real ale in each(which I review in my article). This was a very nice experience because I visited pubs which people from the city, rather than the university, regularly attend. In analyzing the pubs I visited I came to appreciate the businesses and the effort they are making to keep business local and provide Norwich with comfortable social gathering places. I had extended conversations with locals for the first time this year I believe, and it was a very enjoyable experience. My friends and I met some people we hope to see again at the White Lion, as we talked for over an hour and even went to a kebab shop together afterwards. I brought the Norfolk Nips current issue with me and studied it to figure out the sort of length my project should be and also in order to determine what my articles should contain to have value to the magazine. That is, what information will be pertinent as well as unique. May 5th, 13:45-15:30 in Eurostar Terminal Gare Du Nord, Paris. Reviewing notes, creating outline. Wrote description of the Plough and Trafford arms. Decided on main concepts of Trafford Arms article- that it is formal, fine and has highish prices and not the best beer selection. Wrote much of White Lion article in journal. Reviewed the beer I tried and gave detailed description. Determined some research to be done. Devised format for articles—4 sections. 1- structure and appearance of pub 2-commentary on structure as it applies to the focus of the pub 3- beer selection including locality, price and variation, real ales and amount of gravity/pump beers, etc 4- Other major offering of the pubs including hot food and other drinks, what that says about the pub 5- review of the beer which I tried. Also wrote rough draft of Trafford Arms article. Editing, transferring work from notebook to laptop, writing Plough article, finishing each article and putting into proper format, researching beer locality and reading up on websites for additional information. Writing the ‘other’ section of each article, writing about the bar location and what that means for a pub, etc etc etc. My work with CAMra actually doesn’t stop now. I’m going to write an article about the ‘City of Ale’ festival in late May and Warren and I have spoken about a continued correspondence, in which I write articles about local beer movements in my area, when I return to the states, provided my articles are liked. The main website for Norwich CAMra. Check this out for awards winning pubs and ales if you are interested. Today I got to participate in The Creation! That’s sort of a big deal. 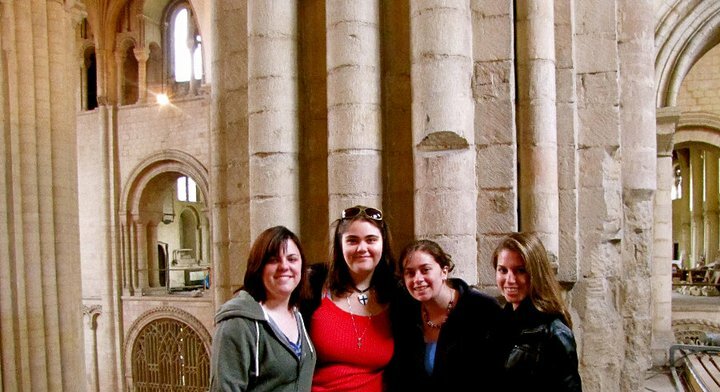 I got to work closely with Juliet, which was awesome because when I volunteered at the Cathedral before I didn’t get to see her very often because she was so busy. She and I, along with one other volunteer who took the groups on tours of the Cathedral, worked with two groups of children- one which consisted of kids ages 4 to7 and one of kids 8 to11- to tell them the story of The Creation in a way which they could easily understand. 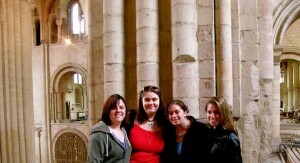 Mary would take one group on a tour of the Cathedral while Juliet and I did a crafts project with the other group. First we took the kids to the Herb Garden where they got to look at all of the different herbs and cut off pieces to use in a craft project later. When we got back to the room, Juliet would tell the story of The Creation with visual aids and would then explain the activity, which involved gluing things of their creation to a large backdrop consisting of a land- and seascape. We helped children, then, as they created the animals and plants to be part of the world of their creation. It was actually amazingly fun. I really got in touch with my inner child: when we had a free moment I made a tiger out of felt. I’m pretty proud of its artistic merit. The kids, who were great fun, came with their teacher and some parent volunteers all the way from Diss. The teacher made the effort to get to know things about me and even asked if I was planning to go into teaching. The children also were very curious about who I was (particularly because of my accent) and really enjoyed telling me about themselves. Unfortunately, because of British law, I wasn’t allowed to take any pictures of the activity because it involved children so I had to settle with using the image from the Cathedral’s website about community learning. After volunteering I, once again, got to experience a side of the Cathedral that most people don’t get to see: Juliet took me to look at (and play with) some really old Bibles. One was from 1536 and another was supposedly the Bible on which Queen Victoria was sworn in!! It’s obvious that volunteering opens the door to all kinds of cool experiences that I could never anticipate! On the second day of the Easter Experience, I had the same job as the previous day: supervising the crafts table. Again, I had a great time with the kids and their parents. It was really interesting watching the interfamilial interactions, and I was able to infer some things about the community based on my observations. I was interested to learn how far-reaching information about the event spread; it seems that many people came a decent distance to come to the Cathedral today and a lot of families who don’t normally come into town ventured over to participate. At first it was surprising just how many people came to a religious activity but, since the Church of England is such a prominent institution, it began to make sense. Today, after the Experience was over, we helped clean up the area and carried some things away for storage. I’m so glad I decided to volunteer again (and to help clean up) because, in doing so, the coordinator Juliet decided to take us on a tour of some of the parts of the Cathedral that are inaccessible to the general public. We got to see the old classrooms in the Cathedral and explore the triforium, which was amazing! Juliet, as well as the other Cathedral staff, was amazing and friendly and not at all what I expected from someone who works at a religious institution. Everyone was so welcoming and really made volunteering a wonderful experience. 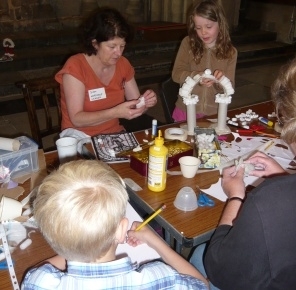 My job at the Easter Experience was to supervise the arts and crafts table, one of nine ‘stations’ located around Norwich Cathedral. At the crafts table, children ages 3-11 could do a few different Easter-related activities, including colouring pictures, completing word searches, creating ‘fortune tellers’ featuring Bible trivia, and, the most popular activity, making their own cardstock Easter baskets to take to the Cathedral’s herb garden for an Easter egg hunt. box to help cover the cost of the supplies, but there was no entry fee. fun and most of the people were so friendly. My job was mostly to help the younger kids with constructing their Easter baskets (which were even too challenging for some of the parents to figure out) which means that I spent a lot of the day covered in glue and glitter and felt pen. Many of the kids were really appreciative and their parents would engage me in conversation about my time in Norwich as an American. As someone who is non-religious, it was not only an interesting experience, but also an enlightening one. It was really interesting to see the inner workings of a religious institution and how it handled one of the most important holidays of the year. At six of the ‘stations’ in the Experience, volunteers would tell the kids about the story of the Resurrection in manageable chunks in order to hold their interest. The volunteers would engage the children, both by conversing with them and by letting them participate in some of the activities. For example, at the Garden of Gethsemane station, they got to make little animals out of modelling clay, and at another station they had their feet washed as Christ was said to do. I thought the Cathedral did an excellent job of organising and activity day that was education about the faith without being overly preachy or indoctrinating. All of the volunteers I met were extraordinarily welcoming and friendly and I definitely had a great experience working at the Cathedral. I arrive at the allotment at 10. Since it is Sunday, the allotment is quite busy, so I get straight to work. I have finished clearing my patch of earth, but I need to hover back over every inch of it to pull out any remaining weeds. It is fickle, tedious, unrewarding work, but it is indeed an integral, unavoidable part of the same task that has occupied my hours previously spent at the allotment, one that I do deem rewarding. I spend the entire duration of the alltoment’s Sunday “open hours” 10:00-13:00 busy at work, and I have removed a lot of weeds, tracked down remaining roots from the soil and removed them too. Also, I have raked the soil multiple times to remove rocks, yet, after the three hours spent doing so, there is still plenty of visable work yet to be done; weeds to be pulled and compost to be added. lBut, in spite of this, the progress I have made is quite noticable. I have enjoyed my 20 hours spent at the allotment, and I feel a sense of commitment to the project I have started. Though this last three hours completes my number of required hours, the project is not complete. I plan to return to the allotment during the next “open hours” on Wednesday, talk to Mahesh while he is less busy, and work out a plan to finish the job. I certainly have the time for it, so I think I shall indeed keep volunteering while in Norwich.